This is the second article in my Quad 405/405-2 series. This time I’ve reviewed the legendary Quad 405-2. Read on to find out why so many people love this great amplifier. For restoration details, check out my Quad 405-2 restoration article, and my Quad 405 refresh piece. What an incredible little amplifier the Quad 405 is, even 40+ years later. Tellingly, Quad 405 and 405-2 power amplifiers are most loved by those who prioritise listening to music over controls, blingy meters and gear bragging. I’m not bagging power meters, I love them, but the 405 is a study in elegant, understated design. It’s a true champion of the ‘less is more’ philosophy, an amplifier that simply gets out of the way and plays music. Surely this is what every true hi-fi lover wants in an amplifier..? Is it just me or does the 405 look like it came straight out of the 1940’s? The Quad 405 and 405-2 are almost identical, compact, heavy, amplifiers. Both punch out 100 watts per channel, into 8 ohms. Where they differ is in their ability to deliver current into lower impedances. Specifically, Quad modified the current limiting circuitry of 405-2 to be a little less aggressive. There’s a wider power envelope with the 405-2, allowing it to better drive lower impedance loads. If you own current-hungry speakers or those with a nominal 4 ohm impedance, a 405-2 is the better option. Quad also implemented various iterative improvements over a long period. In my opinion, this makes the later amplifiers sound and perform slightly better. If you are interested in a little more technical detail, I recently overhauled a Quad 405-2. You can read about that here. You can also skip to the ‘Further Reading’ section at the end of this article. Quad’s legendary design engineer, Peter Walker, utilised a principle called ‘feedforward error correction’ in the 405 design. He wrote a paper about it, which you can read here. “This is something we don’t see too often: an entirely new approach to power amplifier design. As Quad points out in its literature for the 405, class-A operation of transistors provides the lowest distortion, but drastically limits the amount of power an output transistor can deliver without overheating. (Most transistor amps use class-AB output operation, in which each of a pair of power transistors handles part of each signal cycle and shuts down during the other part. Stereophile didn’t particularly like the original 405, but they reviewed the 405-2 much more favourably. The Quad 405 and 405-2 are compact units, measuring just 115 x 340.5 x 195mm, or not many inches. A mass of 9kg (some more pounds) makes this a dense amplifier, heavy for its size. The 405 is also powerful, able to deliver 100 watts per channel, more than enough to drive most speakers. I can’t think of a commercially available amplifier that’s more compact, with fewer parts or with a simpler layout than the Quad 405. Tell me if you know of one, I’d be keen to take a look. The driver stage consists of two TO-220 devices operating in class-A, the output stage two matched N-channel TO-3 devices, per channel. The driver stage is a very high-quality amplifier, the output amp is the ‘current dumper’ and is a less precise, more robust unit. This is one entire amplifier channel. Note that there are literally around 50 parts, per channel. The driver and output transistors are thermally coupled to the same block of aluminium. They are also board-mounted, with zero wiring, the whole lot forming an amplifier module. You’ll see this in the images above and below. This design is great for thermally coupling semiconductors, which helps lower distortion. It also minimises superfluous wiring and is an excellent example of clever design. Notice how compact the amplifier modules are, each one roughly the size of your hand. Two boards make up almost the entire amplifier. Other parts include a very high-quality potted transformer, two 10,000uF filter capacitors, some wiring, a large front-mounted heatsink, an LED and some sockets. As a repairer, I can tell you that the Quad 405 and 405-2 are perhaps the easiest amplifiers to service, ever. The entire amplifier consists of the chassis, power transformer, two filter capacitors and two amplifier boards. The whole thing comes completely apart in minutes. It’s easier to describe this amp’s sound by using an oft-used hi-fi euphemism – it doesn’t really have any. That’s not exactly true, but if you get a good one, you can immediately hear that they are special units. From the moment you switch on a good 405 or 405-2, you’ll enjoy relaxed, effortless and fatigue-free listening. Overall, I would say the 405 errs on the warmer, mellower side of things, which is good for low-fatigue listening. The Quad 405 also exhibits very low distortion, which you can hear in the very easy, relaxed sound they produce. If you hear a 405 that doesn’t sound super smooth, there’s definitely something wrong with it. I overhaul a lot of these and whenever I test an overhauled unit, I’m taken by how incredibly good they sound. Evidence comes in the long listening times one can put in with the Quad. The lack of glare and listener fatigue are really noticeable, very unusual with solid-state gear. This is going too far, but you probably get what I mean! Some describe the 405 as sounding rolled off, but I disagree. To me, it sounds smooth and lacking that edgy quality that many transistor amplifiers possess. Measurements don’t support the claim of a rolled off top-end, but it’s not a wide-bandwidth amplifier by any means. Nor is it likely to blow up like one though either! Bass is clean and full, but perhaps not the last word in slam or authority. There’s no ‘bass bloom’ here to flatter small speakers though, just clean, accurate bass. Remember though that this amp has just one pair of output devices per channel. The midrange is warm, detailed and three-dimensional with good source material. This is definitely a strength of the 405-2, like a good valve amplifier perhaps. Sound staging works to enhance this feeling of three-dimensional realism and pinpoint imaging. Overall, a good, fresh Quad 405 or 405-2 is a beautiful sounding amp. My only criticisms are a slight lack of sparkle and air compared with the very best. This dramatically improves with a series of mods that I now do to these amplifiers though. This, combined with slightly reduced energy in the bottom octave are things that separate this amplifier from the very best I’ve heard in my listening room, like the Perreaux PMF-5150B, Krell KSA-150 and BAT VK-500. This is an easy amplifier to work on. You can have the whole unity completely apart and broken down to board level in minutes. It’s equally quick to reassemble. I can’t think of an amplifier that’s easier to work on. You can even remove a side panel and work on a board whilst still attached to the chassis. All parts are replaceable with modern equivalents, but factory parts quality is very high. The only issue that is the current limiting sub-boards are no longer available, but even this is no real problem. You can remove them altogether if you like to operate with no protection! The amp will work fine without them. Better still, they’ve been reverse engineered and are available from Dada Electronics for example. Furthermore, the popularity of the Quad 405 and 405-2 has spurred on the development of a range of modern replacement modules. Some are rubbish, like these cheap Chinese boards found on eBay for example. But others look amazing, like the NET Audio 405-3 boards, designed to be what Quad would have perhaps made, had they refined the design to the nth degree. People often ask me questions about “what would go best with this” and so on. I run my Quad 405-2 with a pair of Yamaha NS-1000M monitors. This is an excellent match, the slightly mellower sound of the Quad 405-2 is a great partner to the airy clarity of the wonderful NS-1000. 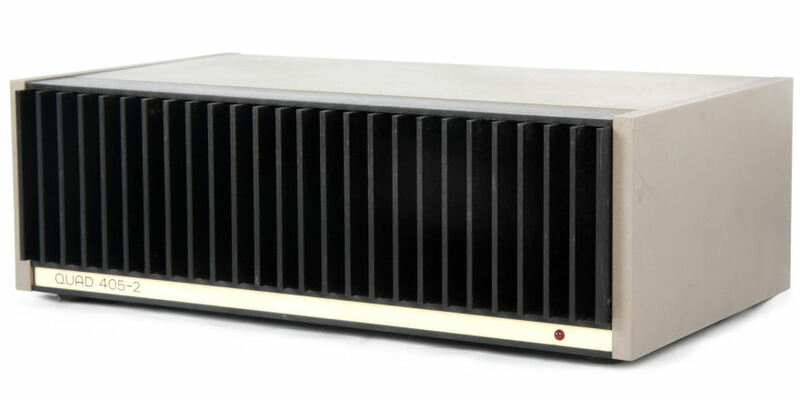 Many will also be aware of the legendary Quad electrostatic speakers like the ESL-57 and later ESL-63. Quad designed the 405 and 405-2 to run these speakers, so this is also an excellent match, a no-brainer if you own 57’s or 63’s. Quad 405s and 405-2s currently sell for around $500 – 750 AUD. They would be a deal even at $1500, so they are a fabulous buy right now. Seriously, what else can you get that sounds this good for 500 bucks? The best thing is the understatement of these lovely amplifiers, like fine pieces of 1950’s English industrial art. You will likely need to get your 405 or 405-2 refreshed if you buy one. Many are running original capacitors and parts, a testament to their durability, but they can be dramatically improved. This is something I’ve been doing now for a while now, with great results. A full restoration is an even better idea. The Stereophile reviews of the 405 and 405-2 are good places to start to get your head around what people were thinking when these amplifiers were released. There is a great 405 review and some background info, here. I’ve written a lot more about the Quad 405, including several pieces about restoration, modifications and upgrades, and servicing. Positive Feedback has a great piece, with lots of mods and other technical details here. Yet another page lists more modifications and upgrades – these amps are so great to work on that people are literally encouraged to play with them! One of my favourite resources, however, is Keith Snook’s fantastic Quad repository. Keith goes into great detail about his own journey with the 405 and breaks things down into two large and very detailed 405 pages. The first covers the original 405 and its various iterations, the second covers the 405-2. Keith’s site really is a wealth of information, so I encourage you to visit and spend some time reading and looking at the schematics, which Keith has painstakingly redrawn into one document showing the changes at each version of the board. You’ll also find the service manual along with all revisions and parts lists, very handy indeed. Interesting article. Why do you think that the Chinese boards are rubbish? Looking at the circuit diagram for the 405, it’s pretty basic and the component cost won’t be a lot. With modern cad I would expect a better pcb layout to be achieved than the original along with better modern components than the original. Have you actually tried the copies to justify the comment? I’m asking as I’m looking at makin a modern ‘copy’ but adding a streaming server to it. Hi Richard, thanks for leaving a comment and I’ll elaborate on a couple of points here that hopefully will help. With that in mind, yes I’ve seen some of the Chinese Quad boards and they were of poor quality, hence my comment. Some I’ve seen are not copies, hence you are not getting a 405, and board quality was poor. I haven’t seen all of them of course, there may be some good copies. Sadly, most Chinese hi-fi and audio boards are of low quality. Regarding parts, no, modern parts are not automatically better. Some modern parts are better, some are worse and the commonly available Chinese parts are usually terrible, especially capacitors and semiconductors. With Chinese kits, there is no QA re what you’re getting, no way of knowing if the CAD layout is better, it could be worse. There are so many terrible fake semiconductors and caps out there now from China that many professionals won’t buy them at all, without quality assurance from a large vendor, myself included. So, with these things in mind, I can’t see the point when you can buy a real Quad 405, with superb boards, transformer, case, parts and pedigree, for a few hundred bucks. There are of course the Net Audio ‘mk 3’ boards, they look good, havent heard them though. In my opinion, there is only one path to follow with classic audio gear that’s to get the original! It’s all about the history, the pedigree, the fact that it sounds the way it does because of the layout and the parts. What pre amps would be a good match with the 405? Any benefit in running two 405s and two preamps as a dual mono (stereo) signal chain? Hi, any high-quality, transparent preamp will work with a high-quality power amp like the 405. Obviously, synergy with the rest of your system and room is very important here, so you’d need to consider this. The 405 can be bridged and run as a mono amp, but realistically, there’s plenty of power there with the 100 Watts a side available with a single amp. It would certainly be interesting to try though! I’ve found that the Schiit Saga is fantastic in front of the Quad 405 with a RCA Black Plate tube in there. I’ve never heard more life like sound reproduction. The 405 is magic with Aurum Cantus F620 speakers (4 ohm). I too am curious about the Chinese 405 Clone boards. As recently as 2006 I was still able to source rebuilt boards from Quad Electronics (International Audio Group) directly from their Huntingdon address for about $90, but I don’t know whether they offer this service anymore. The other options are: spend a few weekends troubleshooting, repairing, and recalibrating the blown board myself or spend $200+ on a replacement or a professional repair. Have you measured or listened to any recent Clone boards? Thanks for any feedback! Hi Ralph, thanks for your question and I realise there are a lot of misunderstandings around cloned boards. I’ve covered some of this in a previous answer but I’ve elaborated here on a couple of important points, I hope it helps. Yes, I have looked at some 405 clone boards and no, I cannot recommend them as a general rule. No, I’ve not seen all of them and no, I’ve not measured any clone 405 boards. I choose not to work on cloned stuff from China, read on to find out why. Consumer-grade Chinese boards contain generally low-grade parts of unknown specification and performance, in most cases non-genuine or fake semiconductors and are generally unqualified and of unknown performance. Clones often contain circuit changes that mean they aren’t even clones. It’s very simple, you’ll end up with an amp that isn’t a Quad 405, with unknown performance characteristics, and it’s probably not even cheaper overall! The original boards are well designed, easy to work on and repair, contain excellent parts of known quality, meet known performance specifications and are the real deal historically and electrically. I guess we each have to decide which elements of that are important to us. For me, originality, parts quality and verified performance are critically important. I completely understand that this isn’t the answer many want to hear, but it comes down to getting what you pay for. The same can be said for fake watches. At first glance, they appear very similar but dig deeper and there is a world of difference between a fake and the real thing. The devil really is in the detail. I mention fakes for good reason. Genuine MJ15024 output devices are around $10 each, from trusted vendors. Does this $50 purchase really contain $40 worth of genuine MJ15024 transistors? What about the cost of all the other parts, aluminium, shipping..? The BOM for these boards using genuine and known-brand parts would come to $100+. When you do some math, you’ll realise that something is amiss. Fake semis are highly problematic and exceptionally common in cheap Chinese gear. When one dies, you relace it with perhaps a genuine semi, and no longer have a matched pair, because the fake used a different die. This causes circuit instability and round and round you go. You always want genuine semiconductors, without exception, so I would be replacing every transistor in one of these kits with the real thing, further adding to the cost. Now I’m not saying don’t try to build one of these, by all means go for it, but realise what you are, and are not getting. Also realise how inexpensive the genuine article is. When you add in the cost of boards, transformer, case, wiring, connectors and time, I can’t see the value in a clone. Anyway, I hope this helps and don’t hesitate to let me know if you have other questions.